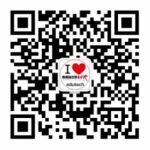 Android Version: 210 Chinese friendly educational apps linked for download from Android.Myapp.Com. 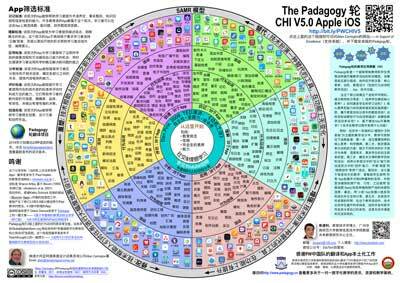 Teaching in Chinese on how to use the Padagogy Wheel. 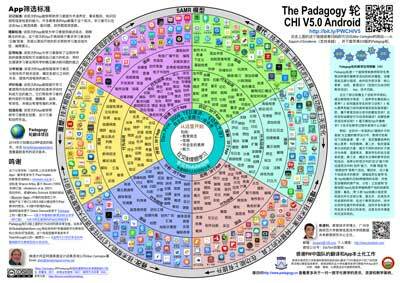 Use the links below to download the Padagogy Wheel Chinese V5 Posters. The 210 apps on the Apple iOS Poster are linked to the Chinese iTunes Preview pages for download. The 210 Apps on the Android Poster are linked to android.myapp.com for download. 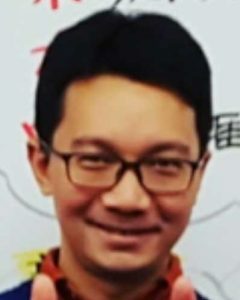 Jiao Jianli, Ph.D. in Edtech. Professor, School of Education and Information Technology, South China Normal University, Guangzhou. Director of Future Education Research Center. 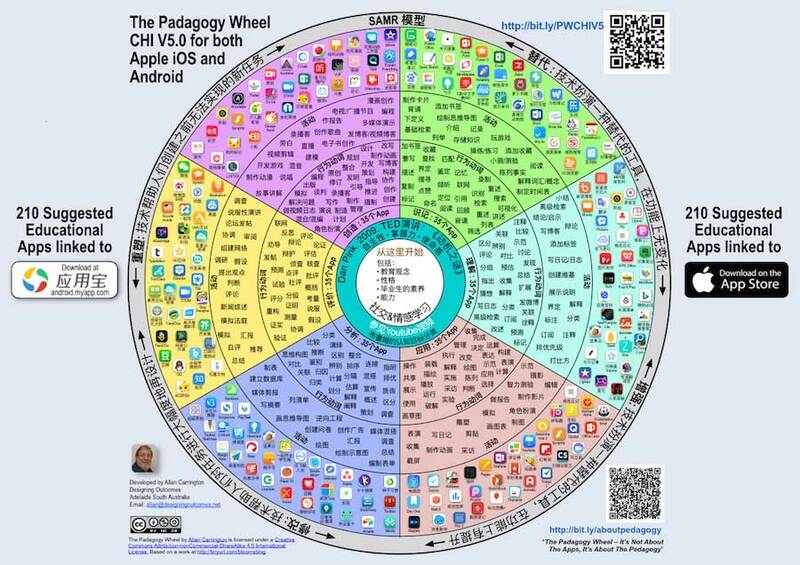 The Padagogy wheel is a wheel model that helps teachers and students use their mobile devices to teach. The model consists of five parts, from inside to outside are: core literacy, motivation, education design (including behavioral verbs and teaching activities), App, technical functions. These five parts are like five gear interlocking. Teachers are advised to consider in order: 1. Students what core qualifications? 2. How to stimulate students’ learning motivation? 3. How to implement the core literacy and ability? That is, what are the goals in the education goal category? What are these behavioral verbs to describe these goals? Which teaching activities to achieve? 4. 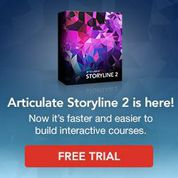 Based on what App to teach? 5 technology in the teaching process to play what function? For example, in the first grade of junior high school, the teaching design with the theme of “The Mystery of Plant Leaves” can be prepared according to the following process: Step one, select the core qualities to be trained: the spirit of science. The second step is to develop a plan to increase motivation: It suggests that leaves of different shapes may be related to latitude and humidity to stimulate students’ desire for spontaneous exploration. The third step is to determine the teaching objectives and activities of this course: to cultivate the ability of “differentiation” in the analysis level and the ability of “creation” at the level of creation, and carry out two activities such as “investigation” and “video creation”. The fourth step is to design information technology-based teaching: Ask each group of students to use the “form” App to shoot and identify the names of the six plants and retrieve the origin and habit of the plants. Then use the “Baidu Maps” App to compare various Latitude and humidity of the plant’s origin; and finally, use the “little shadow” App to capture group findings and conclusions and share it with the entire class. Fifth, reflect on the role that technology plays: In this teaching activity, technical support students explore science, create and publish digital work to share their findings, something that no-technology classroom can not do. We are Chinese #edtech team from Future Education Research Center, South China Normal University in Guangzhou, Guangdong Province, China. Our main research interests are: educational technology, online learning and teaching & learning in one-to-one settings, etc. Johnnie is a professor of Educational Technology. He is currently working as the Director of Future Education and Research Centre (FERC) in South China Normal University. 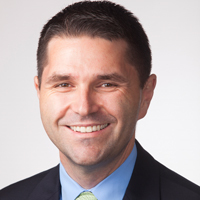 He was recognized as an Apple Distinguished Educator in 2015. 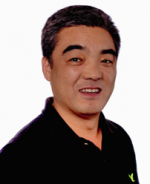 Professor Jiao runs a very popular educational blog, "Johnnie's blog on Educational Technology (www.jiaojianli.com)". He has so far written or translated more than 100 journal papers and books. 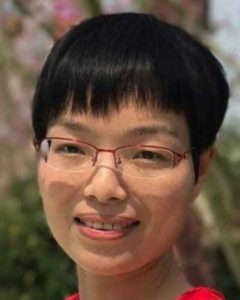 Serlina is a lecturer in School of Foreign Studies at Southern Medical University in Guangzhou, Guangdong Province, China. Her main research interests are: mobile assisted language learning (MALL), one-to-one digital learning, etc. She has been engaging herself in implementing mobile assisted classroom activities since 2014. Clatin is a lecturer in College of Education at Hunan Agricultural University in Changsha, Hunan Province, China. 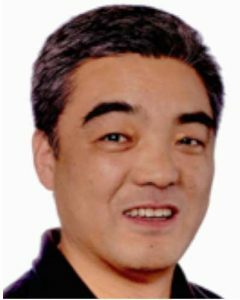 His main research interests are: M-learning, U-learning, etc. He started to run a very popular course known as "Internet and M-learning" since 2013. We would like to extend our heartfelt thanks and appreciation to everyone who has contributed to the success of this project. We are very grateful to LIU Xiaobin (Paul), an associate professor of English education at School of Foreign Studies at South China Normal University in Guangzhou, CHEN Wei, a lecturer in School of English Education at Guangdong University of Foreign Studies in Guangzhou, and YIN Ting (Ecco), a lecturer in School of Foreign Language at Guangdong Polytech University, in Guangzhou, for their help in translating the Padagogy Wheel and the poster. Our special thanks go to YE Donglian, a lecturer of Educational Technology at Shangrao Normal University in Shangrao, JIangxi Province, all the postgraduate students from FERC and the 33 postgraduate students (Grade 2016) from School of Information Technology in Education at South China Normal University, in Guangzhou, for their efforts in testing and reporting the accessibility and functions of the 210 apps in the Android English version, and suggest workable alternatives to apps that are not accessible from China. Thanks to their hard work, the Android Chinese version is listed with 180 user-friendly apps that could be adopted at will by all Chinese teachers. This is Guangzhou by Drone! Meanwhile the Padagogy Wheel Bloom’s Version poster will be available in at least 25 languages by the end of 2018. Fourteen languages are already published. They are • English • Spanish • German • Norwegian • Chinese • Arabic • French • Russian • Czech •˙Hebrew • Hindi • Gujarati • Tamil • Swedish. As well, there are four waiting on artwork and will be published as quickly as possible. They are • Dutch • Polish.• Portuguese • Indonesian. More languages are being translated.. I think it is very useful for us teachers.